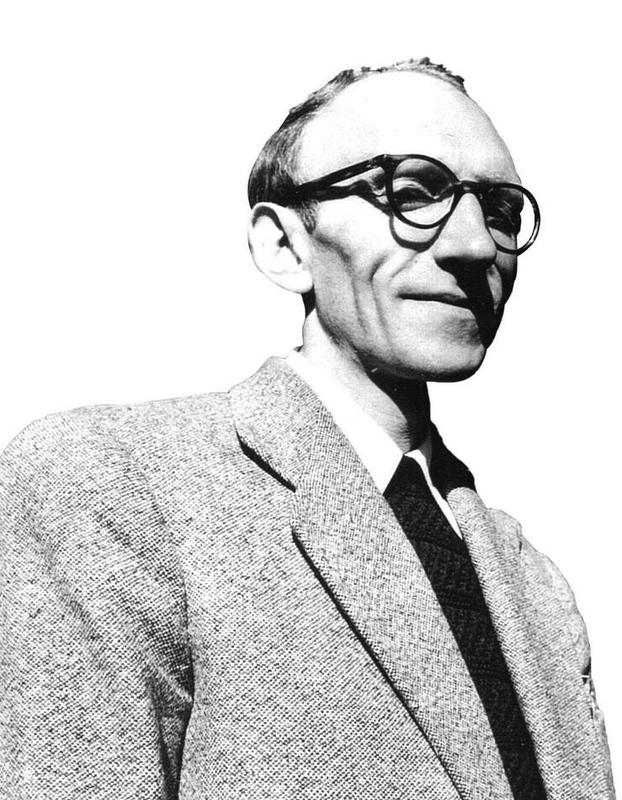 Blanchot’s writings influenced a generation of postmodern and post-structuralist thinkers, and the Blanchot papers provide an incredibly rich research resource not only on Blanchot himself, but also the intellectual life of France in the twentieth century. His political thought was complicated and is still debated today: shifting from the extreme right in pre-World War II France to the extreme left in his opposition to the war in Algeria in the 1950s and support for student protests in 1968. Over the last 30 years of his life his written output was infrequent, and although he remained an important figure for many, he became reclusive. This has perhaps contributed to the intense interest in the unpublished writings he left behind. 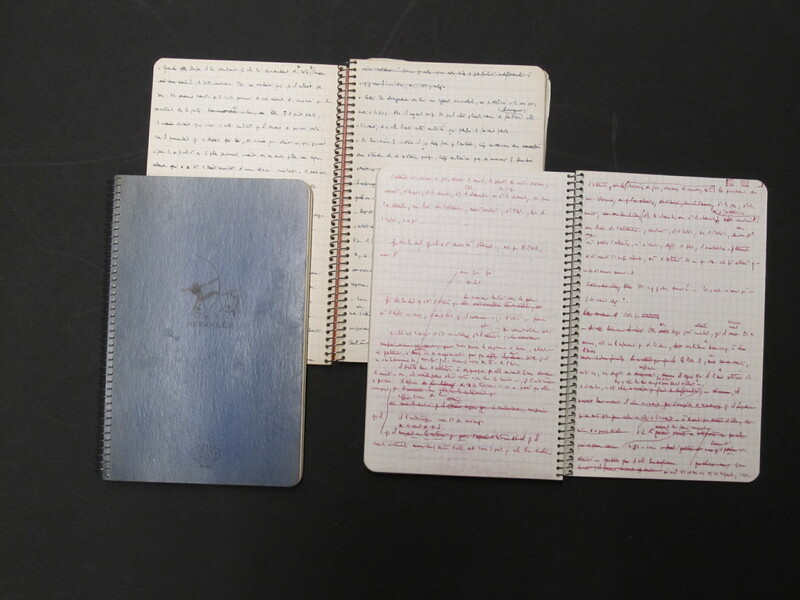 Notebooks kept by Maurice Blanchot. In extent, the archive fills approximately 20 cartons (ca. 25 linear feet). 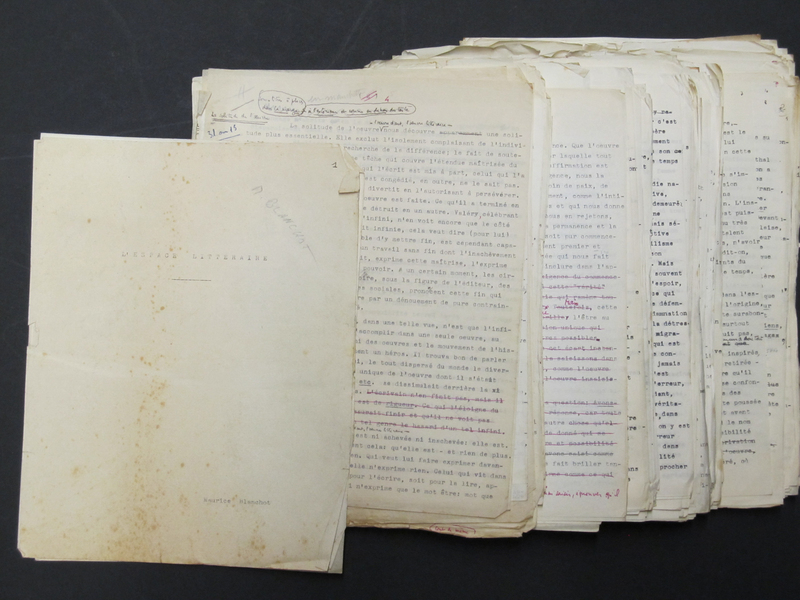 It includes his working manuscripts, typescripts, and proofs of books, essays, and reviews; extensive notes on and translation of Friedrich Nietzsche, Georg Hegel, Martin Heidegger, Karl Marx, and Franz Kafka; reading notes (including notes on Paul Valéry, Françoise Sagan, Marcel Brion, Jean-Paul Sartre, Jacques Derrida, and Michel Foucault); some ephemera from the May 1968 Paris student protests, of which he was an active supporter; twenty-six spiral-bound notebooks containing drafts of letters, reading notes, interview notes, lists of books, etc. ; substantial correspondence with Robert and Monique Antelme, Dominique Aury/Anne Desclos, Georges Bataille, Jacques Derrida, Edmond Jabès, Henri Lefebvre, and with Gallimard and magazine publishers, as well as letters from Jean-Paul Sartre, Jacques Lacan, Emmanuel Levinas, and other philosophers and writers of the period; family correspondence; and hundreds of letters by Denise Rollin, Blanchot’s lover in the mid-1940s. Houghton’s acquisition of the corrected proofs of L’Entretien infini in 2009 attracted much scholarly attention, as the writer’s papers have been inaccessible following his death. An article about that earlier acquisition, by Harvard’s Smith Professor of French Language and Literature Christie McDonald and Curator of Modern Books and Manuscripts Leslie Morris, is available online on Espace Blanchot and The Romance Sphere. This second, much larger and significant acquisition awaits full description, but the archive is now available for research in the Houghton Reading Room. This is a press release written by Houghton Library. Reblogged this on The Love Revolution. A very important acqusition. Through publish of these texts, Blanchot’s work should be rereaded and be raised to its well-deserved place. His very new approach of onthology was a negative phenomenology without an indifferance of phenomenology. He didn’t ignored Sein which breeds in Seiendes, sondern has transcended it as a Sein in Nichts; and as far as I can see in history of revival of phenomenons, the gap in texts of Husserl, Heidegger and Ponty (description of quality of phenomenology (and its products) but not dive into the earth of its) has been bridged via literature narrations of Blanchot. But in a very transcedative and extreme level.